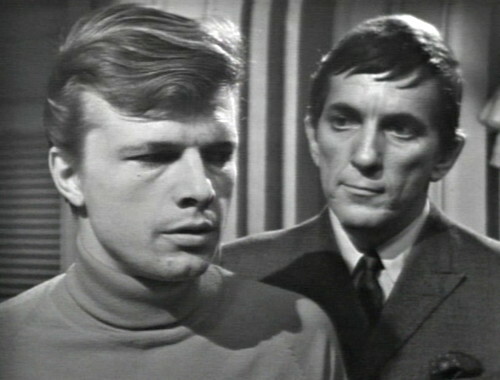 Willie finds Barnabas pacing around Josette’s room. “I’ve been thinking about many things,” says Barnabas, but he’s got a guilty look on his face, like a teenager when Mom asks why he’s been spending so much time in the bathroom lately. Barnabas has decided he can’t wait. This room won’t be empty for long; Victoria Winters will become the new Josette. Willie warns that people will be suspicious if another girl disappears, like Maggie Evans did. Barnabas: It won’t be the same. Miss Evans came here unwillingly. The next one will come of her own free will. Barnabas: Don’t underestimate me. That’s a great error, and if I find you being the least bit uncooperative, you’ll regret it. Then he suddenly brightens up. Barnabas is the new main character of the show, so they’re rebranding him. He still has to threaten Willie every two minutes, but he’s more cheerful about it. And it’s true, the Old House has had kind of a negative vibe. That’s mostly because Barnabas has been killing drifters and holding girls hostage in the basement, but he’s got a point. He rubs his hands together, and frowns in thought. Barnabas: Now, let me see. A dinner party would be too formal, too unrelaxed. And how cute is that? The sadistic killer is planning a social activity, it’s adorable. Then he spots Josette’s dress, laying on the bed. Barnabas: Of course! A costume party! He walks around the room, excited. Barnabas: Everyone will come dressed in the costume of that period. We will relive a moment out of the past. And Miss Winters will wear Josette’s dress. So that’s our storyline for the rest of the week. You’re just going to have to learn to live with it. 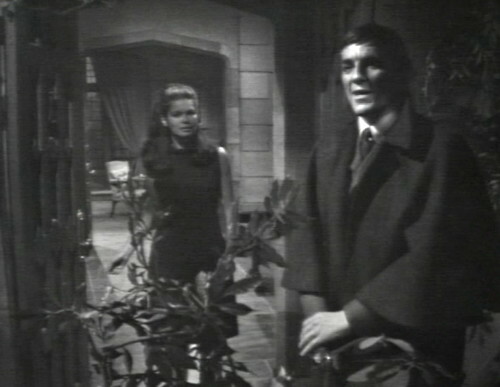 Barnabas strolls over to Collinwood, and Vicki answers the door. He greets her with a smile and a wave of the hand, indicating the scenery. Barnabas: I was just enjoying the view of the ocean. Have you noticed it tonight? She says, “Sure, I live here. I see it every day. It’s the big wet thing, right?” But she only says that in my imagination. He starts feeding her some vampire pickup lines. Barnabas: I like the night very much. Do you? Barnabas: I prefer it. I find the daylight harsh and cruel. Whereas the night is kind, and soft. Vicki: I think that the night can be as cruel as the day. It all depends on the circumstances. You know, listening to these two talk, they do seem kind of perfect for each other. They talk exactly the same kind of crap. He starts talking smack about the sun. Apparently he’s not a fan. Barnabas: One cannot even look upon it without being blinded. It burns the skin, it scorches the earth. Vicki: But our whole universe revolves around it. We can’t exist without it. Barnabas: For me, it is to be avoided rather than adored. So, now we know that Vicki thinks that the universe revolves around the sun. I hope she’s not in charge of David’s science curriculum. Then it’s time for some Dracula-style “I never drink… wine” double entendres. Vicki: But Mr. Collins, man was designed to live with the sun. Barnabas: And I have been redesigned to live without it. Barnabas: Well, simply that — I find myself more active and alive at night. Vicki: But then when do you sleep? Barnabas: I find the time. So, to recap: yesterday, Barnabas strangled a guy, and buried him in an unmarked grave. Now, the girl he has a crush on is hanging on his every word, as they stare at the moon and discuss remedial astronomy. 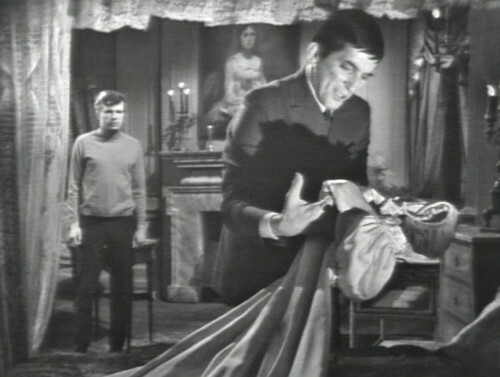 This storyline has transitioned incredibly quickly into a standard soap opera narrative configuration — a love triangle between Barnabas, Vicki and Burke. Barnabas steps out of the mausoleum, and right into the role of the smooth operator — the dark, old-fashioned, vaguely-European stranger with a tragic past. He’s the guy that the woman finds herself strangely drawn to, because she understands his pain, and besides he’s probably the Count of Moldovia or whatever. That means that Burke must be the down-to-earth boyfriend, who offers simple pleasures like dinner, dancing and not hanging around in graveyards. And here’s the thing: The narrative pattern of the love triangle is so well-known, and so powerful, that all you have to do is put a male character and a female character in the same shot, and everybody knows what to expect. 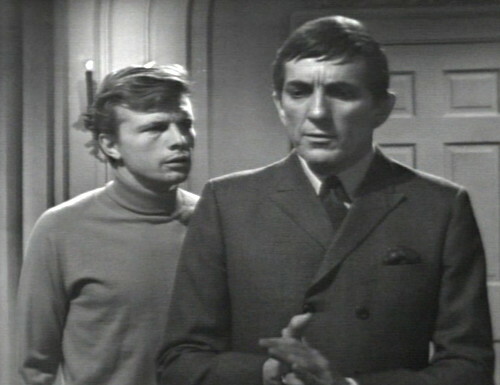 Barnabas will give Vicki a couple of expensive gifts, and they’ll bond over some shared interest that Burke doesn’t understand. Burke will get suspicious, and start investigating Barnabas’ so-called tragic past. Vicki will be horrified when she learns that Burke’s been unkind to her charming new friend, and she’ll make him apologize. And then the organ music starts playing, and we’re invited to tune in tomorrow for another episode of Vicki Winters, Girl Governess. But it works. You can’t fight it. 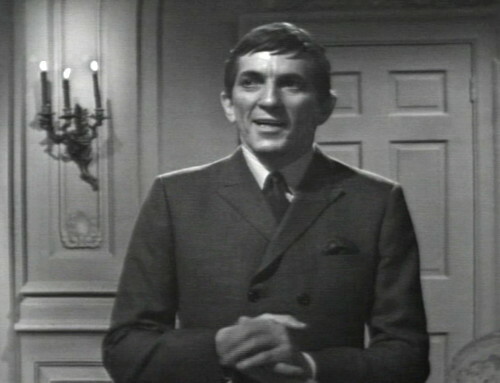 Jonathan Frid’s fan mail has been growing over the summer, and right here is where we reach the tipping point. He’s going to start getting hundreds of letters a week, mostly from housewives who are tired of their boring-Burke husbands. So when the cultured gentleman from the English branch of the family invites his cousins to his crackpot costume ball, how can they resist? Everyone will come to the party dressed as members of the 1790s Collins family. Obviously, Barnabas will be dressed as his ancestor, “the original Barnabas”. Roger and Liz will come dressed as Barnabas’ parents, Joshua and Naomi. And Vicki is invited too; she’ll come dressed as Josette. Vicki’s response to this admittedly challenging statement is to turn her head and look vaguely ill. But she does that a lot; it probably doesn’t mean anything. Tomorrow: Of Course! A Costume Party! 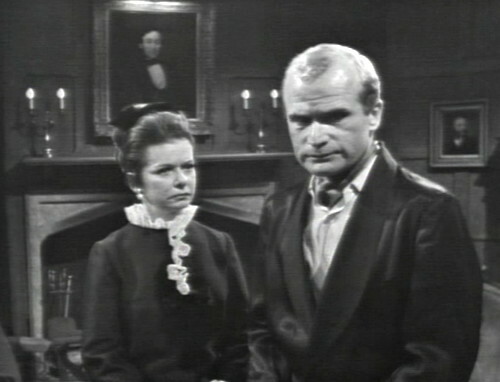 When they come back from the commercial to resume Liz and Roger’s conversation about Jason, they’re both clearly unsure who’s supposed to talk first. Roger: Well, it seems… so it seems. Liz: (She checks again.) Why? Roger: Well… (He gives up, and turns to face the teleprompter too.) That wardrobe you bought him, it’s still upstairs. There’s also some interesting door action. When Barnabas knocks on the front doors in act 2, they wobble; they’re not quite closed. Vicki opens the front door for Barnabas, and you can see through the foyer and into the drawing room. 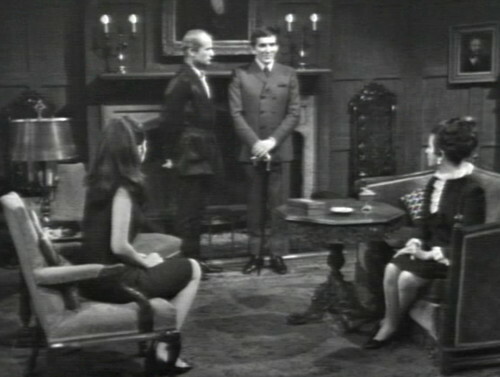 When Barnabas walks into the house at the beginning of act 3, the drawing room doors are closed, and Vicki has to open them to tell Liz and Roger that Barnabas is here. 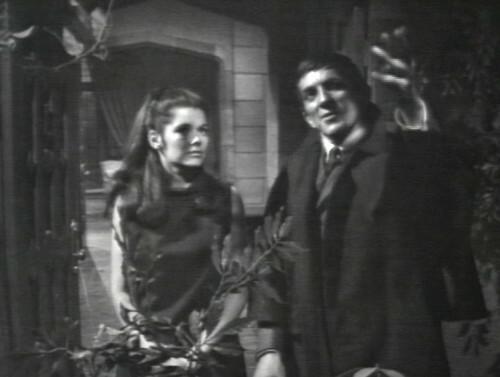 “Barnabas strolls over to Collinwood, and Vicki answers the door. He greets her with a smile and a wave of the hand, indicating the scenery. 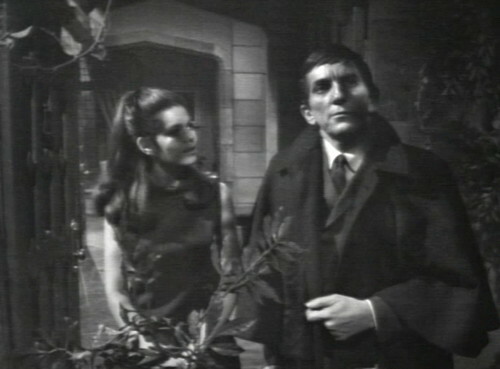 I loved the dialogue between Barnabas and Vicki — it had an old-fashioned, slightly Jane Austen feel to it: the man and woman exchanging polite and vaguely philosophical observations about impersonal topics like night and day, moon and sun, etc. I thought Barnabas was doing a great job in the come-on department until he stepped in it with the line about how he wants to discuss “life and death” with her. He can play the smooth operator only so long, it appears — til his warped idea of what’s normal takes him a step too far. Still, he’s doing a pretty good job for a guy who hasn’t had a date in over 200 years; already he’s figured out that straightforward abduction doesn’t deliver the results he wants. Interesting about the fan mail. If I’d known how, when I was 8 I would’ve scrawled a lovestruck fan letter to Mr. Frid myself. And in later years I probably would’ve felt embarrassed about being so dopey. Even more so if I’d sent such a letter when I was older than 8. And yet — if not for “dopey” housewives and teenage girls sending letters, the show’s producers would never have realized what they had going with Barnabas. They could easily have staked him after a few weeks, as originally planned. Smitten fans and a flood of lovestruck fan mail saved the character and, thus, the entire show. Fascinating. “…talking smack about the sun.” It’s two days later, and this still cracks me up. Danny, you’re a genius!